by both sides of the school building project debate. 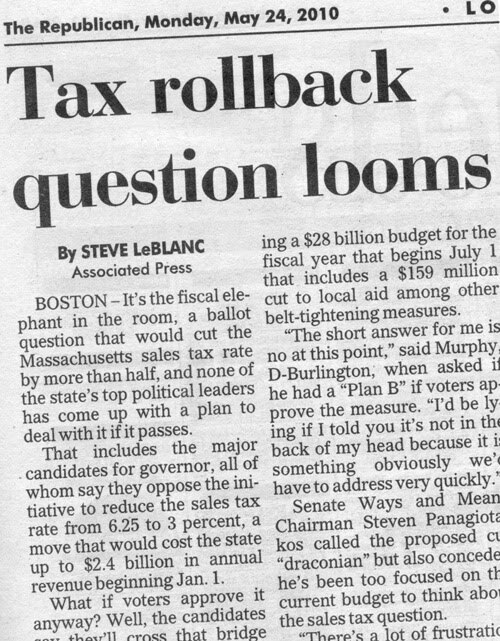 As described in a news story that appeared in yesterday's Republican, there is an active ballot question initiative to reduce Massachusetts sales taxes from 6.25% to 3%. 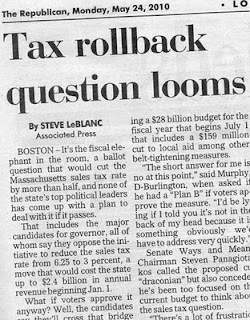 Approval of this ballot question in November would reduce annual state revenue by up to $2.4 billion beginning January 1, 2011. A recent poll by Suffolk University/ WHDH-TV found 49% supporting the initiative and 44% opposed and 7% undecided. According to Michael Widmer of the business-backed Mass Taxpayers Foundation that does not support the initiative, half of the state budget is dedicated to mandatory spending with only local aid to cities and towns, human education and higher education available for cuts. 1. Katherine Craven- Executive Director of the MSBA told us last week that one percent of the state sales tax is committed to the MSBA and used to provide money for Massachusetts school building projects. If Longmeadow does not approve the grant money now, the funds used by MSBA may be reduced significantly and not be available to Longmeadow in the future. She did state that the promised funds for Longmeadow are already set aside. 2. A relatively small reduction (4%) in state aid to Longmeadow for the upcoming FY2011 caused a significant reduction in town services including teacher/ town employee layoffs, reductions in town/school services and a teachers contract with 0% COLAs for the next two years. Any significant cut in state aid that may result through voter approval of the state sales tax reduction will likely require additional Proposition 2½ overrides over the next 1-5 years to maintain the current level of school and town services. If these additional overrides are not approved, this will necessitate drastic reductions in school/town services in order to balance the budget. The new high school building project costing Longmeadow $44 million over 25 years is akin to a ~$3.2 million override in starting in FY2013 (July 2012)- not something that we should dismiss without serious deliberate thought. In FY2013 we will also be renegotiating the teachers and other town employee contracts again. Our infrastructure needs, the uncertainty of state aid to cities and towns and our limited financial resources highlight the need to consider this school building project decision very carefully. What is before Longmeadow voters? We have 1 issue to decide tomorrow night: whether to accept Commonwealth money earmarked for Longmeadow's High School, or to reject that offer. If we vote no, there is not another plan waiting in the wings. We would need to start from square one, and the money the Commonwealth held for us will go back into their general pool for building projects. The LHS would not get repaired; nothing constructive would happen as a result of a no vote. If we choose YES, however, we benefit in many ways. One way is through the favorable economic climate for such large scale projects. Our interest rate would be at an historic low, and construction bids would likely come in lower than at another time. Evidence from other districts bears this out. Another way is that the timeframe for building would be expedited. Two years--two years without kids in trailers. The Finance Committee's opinions on this project matter to some degree, since they are the long range planning financial group for Town Meeting. As of this writing, they have not presented Longmeadow with a long range plan, however. Any informal discussion that they may have had regarding other projects is uninformed by a variety of factors: What is the cost for each item? Will we receive grants or other aid from the state or federal government for such projects? There are too many unknowns for the FC to make any valid claim about the future. It is a shame that our FC would waste time discussing that which they have no control over. Aristotle even classifies deliberation as that which includes practical matters within people’s power (In The Rhetoric, 1359a); there are too many unknowns for them to deliberate about such possible future items. They are inconsequential to the issue before us. We know the consequences of inaction-voting no. We know the benefits of acting positively with a YES vote. Those concerns, plus our values and interests, are legitimate to consider. I hope Town Meeting decides to keep its eyes on the prize. Below is Article #1 for the Special Town Meeting warrant that will be discussed and voted on Tuesday, May 25 at Longmeadow HS. The Longmeadow Finance Committee (LFC) will provide a recommendation to the Town Meeting floor regarding the impact of the pending High School Building project on future property taxes. To see if the Town will vote to appropriate, borrow or transfer from available funds, a sum of money to be expended under the direction of the School Building Committee for Longmeadow High School, located at 95 Grassy Gutter Road, between Bliss Road and Williams Street in Longmeadow, Massachusetts, which school facility shall have an anticipated useful life as an educational facility for the instruction of school children of at least 50 years, and for which the Town may be eligible for a school construction grant from the Massachusetts School Building Authority (“MSBA”). The MSBA’s grant program is a non-entitlement, discretionary program based on need, as determined by the MSBA, and any project costs the Town incurs in excess of any grant approved by and received from the MSBA shall be the sole responsibility of the Town. Any grant that the Town of Longmeadow may receive from the MSBA for the Project shall not exceed the lesser of (1) fifty one point eight four percent (51.84%) of eligible, approved project costs, as determined by the MSBA, or (2) the total maximum grant amount determined by the MSBA. The LFC reviewed a forecast prepared by Paul Pasterczyk, Longmeadow Finance Director showing the impact of the High School Building Project on Longmeadow property taxes for the next ten years (--> 2020). As part of this analysis, the impact of a series of 3- $1 million overrides (pretty conservative at an average of $3ooK/year) + construction of a new $9 million DPW facility in 2017 (much lower capital investment than the $150 million estimate for water/sewer and major building projects provided by the A Better Longmeadow/ Vote NO group) were included. High School Project not approved + $1 million operational overrides in FY2012, FY2015 and FY2018. High School Project approved + $1 million operational overrides in FY2012, FY2015 and FY2018. High School Project approved + $1 million operational overrides in FY2012, FY2015 and FY2018 + construction of $9 million DPW facility in 2017. One more case: do nothing.... a 2.5% annual increase (compounded) for 10 years results in a 28% increase in property taxes. I was surprised by the relatively small difference in financial results for the three different 10 year projections. However, the analysis did show an increase in property taxes ranging from 39 - 48% for the average homeowner over the next ten years. Obviously, there are many additional factors (state aid, health care costs, employee salaries, etc.) that could affect future property taxes, operational overrides and reductions in town services. This latest analysis is relatively conservative with only one additional $9 million capital project and 3- $1 million operational overrides over 10 years. This type of financial analysis can be extremely useful in making long term financial decisions. I hope that the LFC continues to probe our financial future… it would be a welcome change from the year to year planning that Longmeadow always seems to be using. Based upon what I heard at Tuesday’s meeting, the LFC will “recommend” that approval of the new high school project is “feasible”. They will likely share some of the 10 year property tax projections that I have included with this posting. We need to do something with Longmeadow High School…. The key question is how much can we afford!